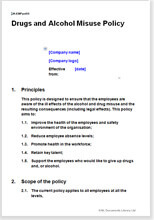 All inclusive policy which aids compliance with duties under health and safety law as well as acting as a warning to employees about the consequences of drug and alcohol misuse. This document provides a framework in which employees can seek help in order to resolve any addictions rather than a framework under which they will automatically be punished. Alcohol and drug misuse is everyone's concern. Not only does it damage the employee’s health, but it can cost employers through absenteeism and reduced productivity. It may also increase the risk of accidents. Health and Safety at Work legislation ensures that employers are responsible for prohibiting drug and alcohol misuse. Turning a blind eye is no excuse.